I love recipes like this because they’re easy, healthy, delicious, and versatile. Feel free to substitute broccoli or cauliflower in place of the asparagus, or add all three. Throw in some carrots too, if that sounds good to you. The possibilities are endless. *Note: You’ll notice the instructions say to not rinse the chickpeas. The chickpea liquid is called aquafaba and the little bit included in this recipe acts as a mild thickener. Heat oil in a large skillet. Once hot, add the tempeh, onion, corn, peas and garlic. Saute over medium heat until onions are golden (5 to 6 minutes.) Add the wine/vinegar to deglaze the pan. Stir. 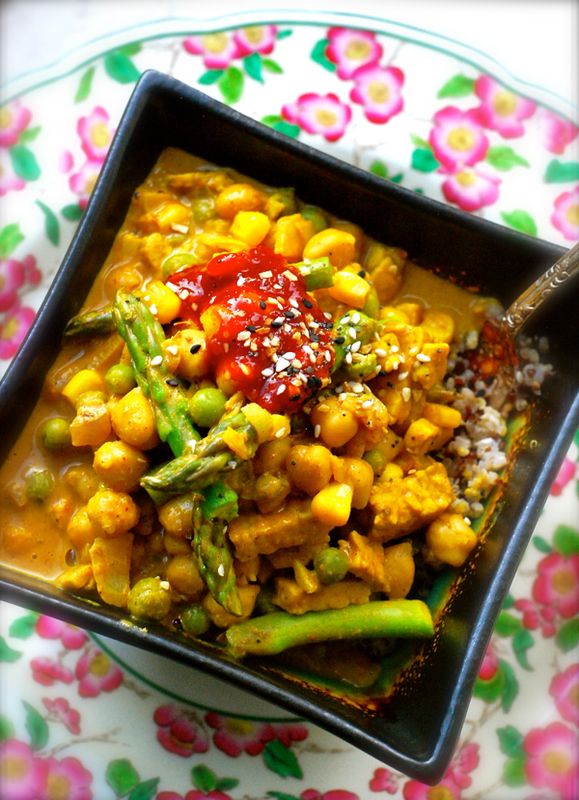 Add the chickpeas, coconut milk, peanut butter, all the spices, and nutritional yeast. Turn heat to low and cook until thickened (approximately 10 minutes.) Stir occasionally. Add fresh asparagus spears during last 5 minutes of cooking time. Top with any or all of the following: sesame oil and/or hot sauce, soy sauce, peanuts or cashews, apple or mango chunks, fresh cilantro leaves, tomato chunks, unsweetened coconut flakes, and sesame seeds.